Music Generation in partnership with the CME Institute for Choral Teacher Education, the Association of Irish Choirs and DIT Conservatory of Music and Drama present Conducting Young Choirs in the World Today: Into the Future, an accredited Professional Development Course in Choral Music Education, which will take place from 14 – 17 July, 2015 in the wonderful environment of NUI Maynooth. 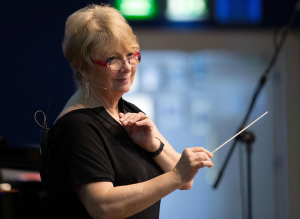 The four day residential course offers a fantastic opportunity for musicians, music teachers and choral conductors working with children’s and youth choirs to gain accredited tuition with renowned international Master Teacher Doreen Rao. The course offers established choral conductors and music teachers, university students, singers and choir leaders, the opportunity to improve their skills through a combination of interactive classes, score study and conducting technique. Celebrated internationally for her moving concerts and inspirational teaching, Doreen Rao’s pioneering approach and work has changed the landscape of music education across the globe. Linking the standards of performance and education with the goals of diversity, inclusion and social responsibility, Rao’s seminal work teaching children to sing inspired a generation of conductors and teachers to lead young choirs in schools and communities around the world. The CME Institute is a distinguished faculty of international repute, which offers highly specialised training for musicians, choral practitioners and music educators working with children and young people. The course will culminate in a large scale public performance in NUI Maynooth, featuring a massed choral ensemble of course participants and young artist choirs. Fees for participants range from €100 for a One-Day pass (inclusive of course activities and meals) to €495 (student or CME Artist Teacher participant) and €695 for conductors for full course participation (including course tuition, workshops, certification, housing, meals and a music study pack). Registration for Conducting Young Choirs in the World Today: Into the Future is now open. A 10% Early Bird discount is available if registration and booking is made before 1st April, 2015.